In information technology, scalability is defined as having IT costs rise linearly with increases in IT capacity. Infrastructure on demand (the ability to modify data-processing capacity quickly in response to demand) is the ultimate reflection of a scalable data center because it protects against under- or overinvestment in IT infrastructure. 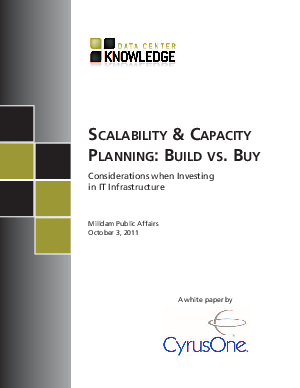 Read this paper to understand the issues that arise when planning for growth of Information Technology infrastructure and to see how the colocation of data centers can provide scalability, enabling users to modify capacity quickly to meet fluctuating demand.